Pin a lifetime of travels throughout the Land of the Free and create a visual reminder of those memories on our Blue Oceans Canvas Travel Map. This United States Travel Map includes continental topographical terrain and is styled with vibrant colors delineating each state and a soft blue background. The rich canvas texture makes the map look like a true work of art! This USA map with pins is highly detailed and includes major highways and has each state capital labeled and highlighted with a star. Instill a love of Geography & Travel in your child at an early age with this map that doubles as a learning tool! Makes a personalized, one-of-a-kind gift for your loved one who is always planning that next big trip. Every Push Pin Travel Map is hand crafted in The United States of America. We take great pride in every map we produce. We start by professionally dry mounting the map on sturdy foamcore board and then frame it in the stylish frame of your choice. A wire hanging kit is already installed, so your map is ready to hang on the wall right out of the box. Find out more details as well as answers to other popular questions in our FAQ section here. Here at Push Pin Travel Maps we believe in choices. That’s why we offer 14 unique frame styles to choose from and dozens of map styles. 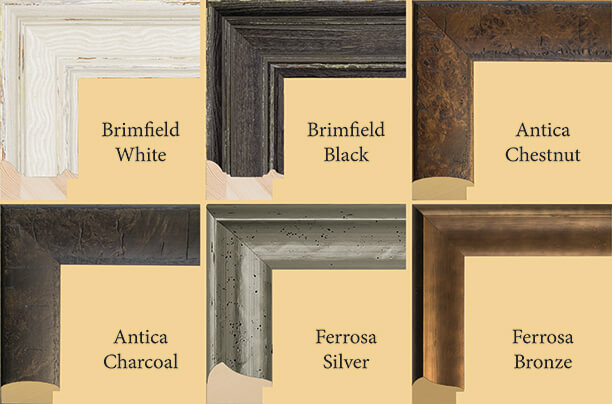 We have 8 standard frames and 6 premium frames in various colors and finishes in order to accommodate different budgets and to help you create the perfect combination to match your personal taste and décor! Our standard frames are anything but ordinary. No cheap plastic frames here! Choose from one of our six unique 2" wood composite frames or one of our two solid wood frames, which are 2.25” wide and include a rich stained finish and an elegant beading. Our standard frames have been the staple of our travel map collection for years and are very highly rated. Check out our reviews to see for yourself! For more information on each individual frame option, click here. While our standard frames are perfect for many customers, we wanted to add some higher end frame options to our travel map collection for those customers looking for a little extra pizzazz. We carefully selected our premium frame offerings after an extensive search for frames that would genuinely complement our Push Pin Travel Maps. Each frame is crafted from solid wood and has a distinctive finish and profile that gives it that art gallery appearance and one-of-a-kind stylistic flair that is sure to inspire wanderlust for a lifetime. For more information on each individual frame option, click here. Your map will arrive ready to hang right out of the box. After you have found the perfect location to proudly display your map, use the included nail and hanger to easily hang it on the wall. No drilling necessary. Easy peasy! Our 6 y/o was using the US map to explain to her sister where we live (MI) and where Texas is. She also pointed out several cities we have visited. We’ve only had it 5 days and they are learning from it. I bought canvas maps, the bright colors look better than on the website; world and US blue oceans map colors match much better than on website. We bought both to hang side by side and they look great! Customer service was also great when I ordered a customization that I typed incorrectly. Oops! I contacted them the next day and my order was immediately put on hold until I corrected my error. I was also amazed how quickly the maps arrived. looks great. now the fun part comes adding the pins. We received our beautiful framed map last Friday. It is unique, fun and very entertaining. We absolutely love it. I'm so glad we made this purchase. Thank you for making such a wonderful product. This is just what we needed. We love it. Already planning another trip just to add a pin. Love the maps. Turned out gorgeous. Only thing. Probably could use 2 hooks. It keeps turning crooked.